MAYFAIR AUCTIONEERS Dix Noonan Webb sold five posy rings in their September jewellery sale – enough for a handful of fingers. Posy rings are rare, and rarely seen at auction, and to have five in a single auction was striking. Popular from the 15th Century through to the 18th Century, posy rings were inscribed with short sentimental or religious inscriptions for a loved one. They take their name from the French word ‘poesy’, meaning short rhyme, and were used to communicate sentiments of friendship, loyalty and, most frequently, love. Today they are very collectable, the rarer inscriptions and enamelled examples and those dating from the 15th and 16th Centuries being particularly sought after. Indeed, Dame Joan Evans’ one and only book on the subject, published by Oxford University Press in 1931, was this year republished by Wartski, the London royal jewellers headed by Geoffrey Munn of Antiques Roadshow fame. The earliest of the lots dated from the late 16th Century and is illustrated. 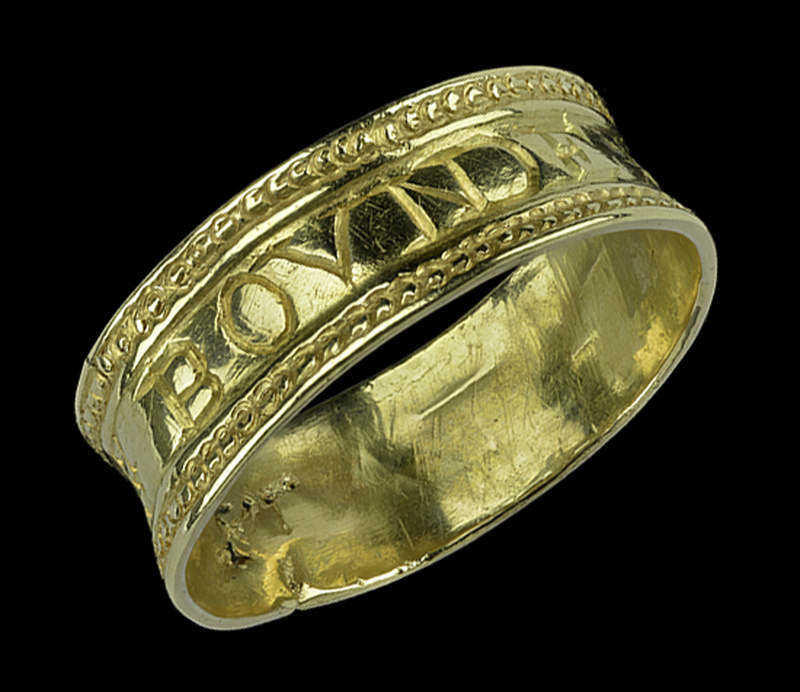 This late medieval example was a gold ring with a broad flat band delicately inscribed on the outside with a cross and the words ‘BOVNDE BY FATHE’ (bound by faith) in serifed capitals. The ring was discovered in Yorkshire in 2012 and was subsequently disclaimed by the Crown under the Treasure Act of 1996. It took £1800 in the room. Another example offered for sale was an 18th century posy ring bearing the romantic inscription ‘My Love to thee Shall Constant be’ on the inside, with the maker’s mark ‘JG’, probably for the London goldsmith John Gamon. This sold for £800. Another 18th Century posy ring had a gold band inscribed on its interior with ‘You never knew a (‘love’ in the form of a heart shape) more true’, with an indistinct maker’s mark. This took £1200. The same ring, but with a slightly different spelling of ‘true’, is listed in Joan Evans’ English Posies and Posy Rings. An 18th Century gold enamelled posy ring with an interior bearing the posy, ‘Not the value but my love’, and the maker’s mark ‘IC’, sold for £1400. Posy rings by the same maker are with the Museum of London and the British Museum. Picture: Sixteenth Century posy ring, £1800 (Dix Noonan Webb).